The requirements of the more difficult species will have to be understood to be successful. That's why I always grow them in (generous) containers (various sizes according to species), not only for convenience, but mainly to control conditions required at the different times of the season. When it comes to watering, when and how much is important as well. I usually water freely when in active growth and flowering, but soon after flowering and seed collecting, growth slows down and so does watering to the point where I keep them barely damp. Too much water combined with too much cold at this time, again could be detrimental for the plant. BTW: It is a well known fact that many pot plants are lost due to over-watering. With the potting medium, the main requirements should be good drainage at all times. Our mix consist of 50% composted bark, 25% pumice and 25% sand, to which I add some well decayed mushroom compost, plus a measure of (9-12 months) slow release, well balanced NPK ( + trace elements), low nitrogen fertiliser. Don't think with this (ours) medium your results will be magically solved. I think the climate, the method of cultivation and potting mix together will determine success. It's best to treat each species separate. Cyrtanthus species seem especially prone to Narcissus bulb fly, at least when grown in California. The larva can attack the bigger bulbs and you may not notice anything wrong until the leaves die back and exploration shows the bulb is soft and being eaten from the inside. Some growers regularly treat their pots with insecticide if they cannot protect the plants. 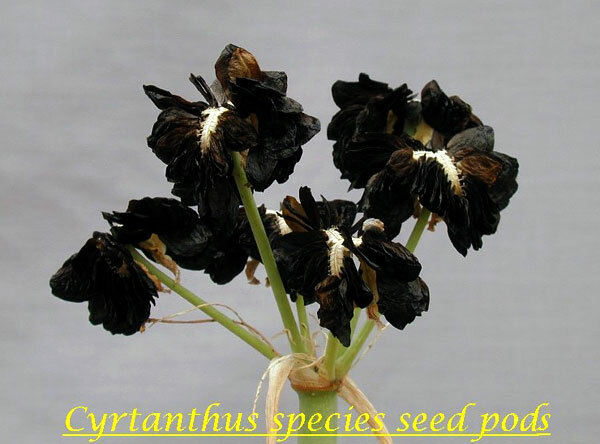 Cyrtanthus seeds are short-lived and should be treated like like fleshy amaryllids. They can be stored in the fridge for up to 6 months. Seeds are often sown on the surface of a well-drained medium and only slightly covered with sand or grit to keep the seeds in place. However, some of our members have better success in floating the seeds until they sprout and then carefully planting them just underneath the medium surface. This is particularly true if your medium is very well-drained and dry out too quickly for the non-floating method. But regardless of what method you choose, the germinating seeds need to be kept moist. In late December 2003 Cyrtanthus was the subject of the pbs list TOW. Introductions were provided by Bill Dijk.